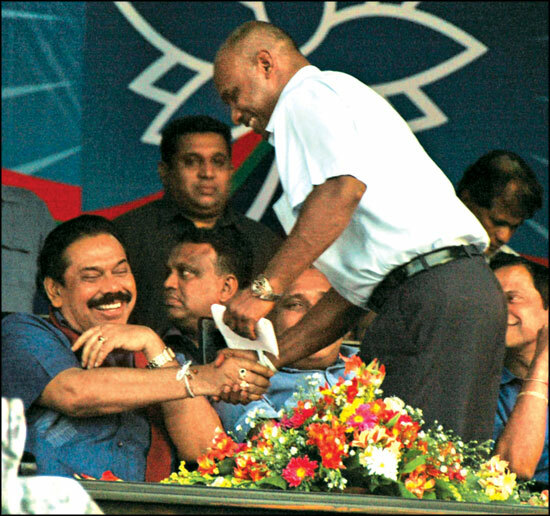 Renowned Cricketer Sanath Jayasuriya greets President Mahinda Rajapaksa in Ambalangoda yesterday. On January 26, the people of this country will tell the world they are against separatism, President Mahinda Rajapaksa said yesterday addressing the massive UPFA election rally at Ambalangoda.He emphatically stated that he would not allow anyone to betray the hard earned freedom won. Some parties are deliberately making an effort to push the country towards a war again. We will take all possible steps to prevent this sinister move, Prime Minister Ratnasiri Wickramanayaka said.